USANA, word! 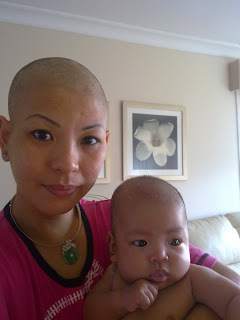 : What’s More Touching Than Fighting Through Cancer During Pregnancy? What’s More Touching Than Fighting Through Cancer During Pregnancy? Cancer Council “Walk to Work Day” is on Friday 16 September 2011. It is an annual event which helps us to build regular walking into our daily routine. It sounds scary – some of us live far away from our office and have busy morning schedules. You don’t have to walk the entire way – you can use public transport and walk the rest of the way to work, and if you are based at home you can still participate by with walking to the shops, using stairs instead of the lift… After all, 15-minute’s walk per day makes a huge difference to your health! Organised by Cancer Council Australia, this approaching event reminded us about one of our USANA Associates, Lanna Le, who fought through breast cancer without knowing that she was pregnant at that time! And more amazingly, the baby girl, Vivienne, was born healthy and has recently turned one! “I was diagnosed with breast cancer in January 2010. Over the past year, I have had operations as part of the treatment process and had to have my right breast removed! My Chemo treatment started in February, and three months later, I received the news that I was pregnant and at 20 weeks! It’s hard to describe my feelings at the time – shall I be happy or be worried?! I put the treatment on hold as the doctors suggested give up on my baby (Vivienne) due to the treatment, medication and operations occurred. They were concerned that the baby would not have a healthy life, but after several scans we were surprised and elated to find that the results were positive! With these results and a strong desire to have a baby, I decided to take the risk and keep my baby. All I could do at that time was pray and hope for the best. This story made me think about families and connections. Family members will worry with you, stand by you, and provide ongoing support. They will congratulate you on your achievements, help you through your difficulties and be there for you whatever the circumstances. Lanna’s USANA team played the role of a family during this tough stage in her life. When Lanna was first diagnosed with breast cancer, she met Annie Tran and Annie’s mother, who helped her understand Buddhism and understand trust and courage. “The mental support that they gave me was just in time and gave me enough courage to fight the cancer, as well as fight to keep my baby.” Lanna says. Lanna was introduced to USANA by Annie Tran and Luyen Pham, and Lanna’s USANA team has been by her side from the beginning! What a big warm family! Show your support to Lanna by leaving comments below.